Writing Myself Out » Ornament swap! 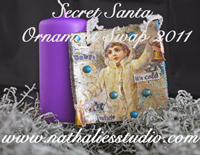 I am so excited — I have decided to participate in a homemade Christmas ornament swap, “Secret Santa” style (ie. one piece sent anonymously). It is being organized by Nathalie (“Nat”) Kalbach, and this is the fifth year of the swap, so I know it’s got some “street cred” behind it, I’ll probably be giving a chair pillow. (The picture in the logo above is one of last year’s ornaments that came from Downtown Ottawa, ON.) I have committed to making and mailing an ornament by Dec. 1, and I should receive one in the mail some time after that. If you are interested too, here is the post on Nat’s blog. She is taking new participants until Nov. 15. Now to start brainstorming ornament ideas…! I got my ornament today. THANK YOU SO MUCH FOR IT!! !